In 2017, a bag of chips knows when you’ve had too much to drink. The bag, a creation by Goodby Silverstein & Partners, comes equipped with tech that’ll help you get home safely after having a few too many. 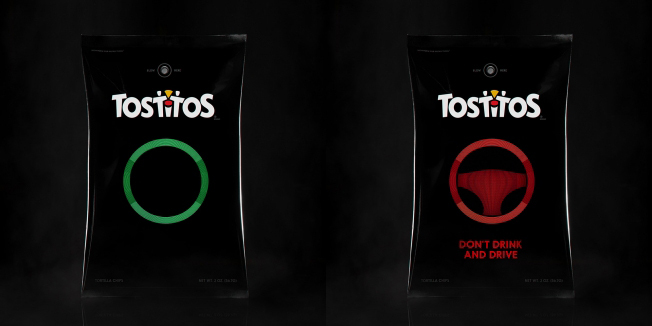 Tostitos’ limited edition ‘Party Safe’ bag comes outfitted with a sensor connected to a microcontroller capable of picking up trace amounts of alcohol on your god-awful post-game breath. Once it detects alcohol, the bag displays a red steering wheel and a “Don’t Drink and Drive” message. Better, the Party Safe package communicates over NFC (near-field communication) and allows drunken football fans to summon an Uber by tapping their phone against the bag. A partnership between Tostitos, Uber, and MADD (Mothers Against Drunk Driving) even offers partygoers a $10 coupon to use on their ride home.